(PhysOrg.com) -- Does it matter if nature solves the same problem multiple ways? 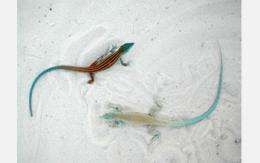 A NSF-supported study of lizard populations in White Sands, New Mexico has helped researcher Erica Rosenblum of the University of Idaho begin to answer that question. 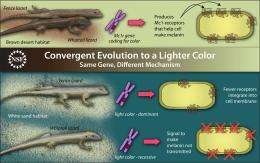 Published December 28 in the Proceedings of the National Academy of Sciences, the article describes genetic differences between lizards found in habitats that contain white or dark soils. These stark differences in color are an ideal environment to study natural selection and gene flow.